Medtronic mySentry | KC & Co.
*UPDATE: HAPPILY USING THE MYSENTRY WITH THE 530G PUMP AND ENLITES! I had planned on my next post being about “The Light Under The Door”–it is what I look for each morning as I approach KC’s bedroom. I find myself holding my breath as I open my door and head around the corner to her room. I say a little prayer that her light will be on…i.e., that she is awake and well. I shared this thought with a D-Mama friend last week. The next day, I received a message from her with a link to the Medtronic mySentry I knew I had to have it! This is the piece that has been missing from the pump/CGM combination. 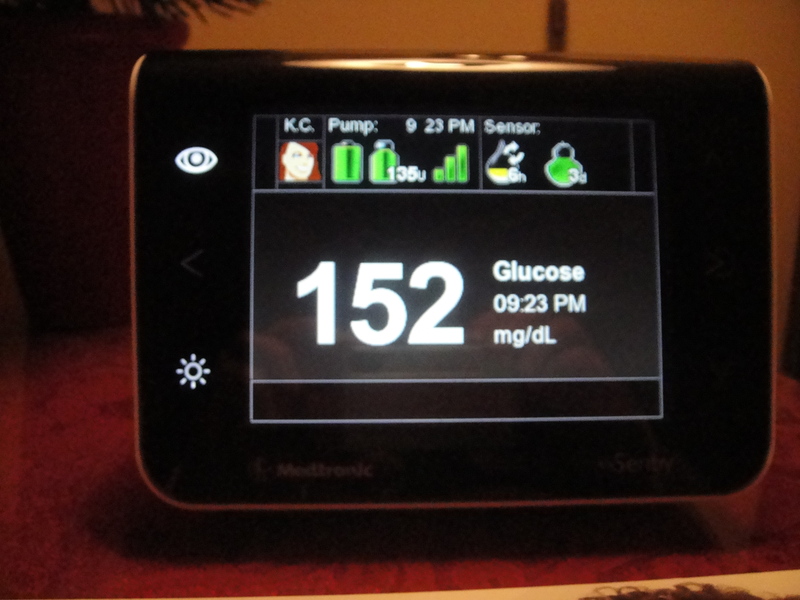 I love the CGM and the information it provides us about KC’s glucose levels. My only complaint has been that she sleeps through the high and low alarms that go off during the night. So the idea of a monitor that can be placed in my room, that will give me the same information that is on her pump including alerting me of highs and lows is something I knew I needed. As other parents of CWD know, there is no such thing as a good night’s sleep after your child has been diagnosed with Type 1. We wait up to make sure BG levels are in the “magic” range. We wake up to check throughout the night. Could it be possible that technology would provide a tool that could help us manage the wee hours? I googled the mySentry immediately…specifically the cost. I knew that chances are insurance companies won’t be covering this item yet. But I felt that there is nothing, other than a cure for T1DM, that I wanted more than this piece of equipment. I set out to make it happen. Contacted my Medtronic rep to confirm cost ($3000 retail, but introductory price of $2400 to current Medtronic pump/CGM users–special offer of an additional $500 off for people buying the pump/CGM/mySentry as one package. Upfront cost is 20% downpayment). As always, Medtronic has financing available and will provide help in filing insurance claims–but again, the product is so new that Medicare hasn’t even created an insurance code for it. Next on the list was doctor’s approval–email sent and approval granted in an hour. mySentry ordered and delivered in 4 business days. 1. Installation was easy (except for human error of forgetting to advance the menu on the monitor while waiting for the pump–). It took less than 2 minutes for the monitor to find the pump. Equally easy to set up the Outpost (the transmitter that needs to be less than 6 feet from the pump). 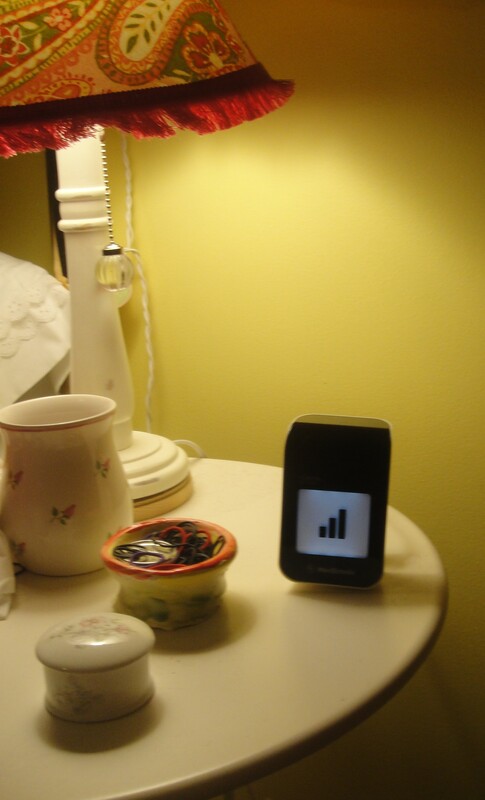 I put KC’s Outpost on her bedside table and the monitor on mine. Her room is down an “L” shaped hallway from mine and transmission reception is perfect. Also the monitor still reads her even when she is in the family room below her bedroom. 2. Manual says that cell phones and WiFi may hinder the reception…however, KC was on her laptop and cellphone and transmission was perfect. 3. Today was a site change day and a quick glance at the monitor before bed let me know that she would need to recalibrate her CGM at 3 am. This gave me the opportunity to recalibrate right away instead of having the alarm go off. Noticed that KC was a little high and gave her a correction by pump. Off to bed! 4. 2 am: alarm goes off on the monitor–“unable to find pump” . Happy to report that the alarm is not an annoying sound but definitely recognizable. Moved the Outpost a little closer to KC and rechecked her BG–over 300. Pump was working fine–I gave her a correction by shot and went back to bed. -Monitor was reporting her current pump information. Looked at monitor several times during the rest of the night–saw her numbers go down. Then at 8:30 high prediction alert sounded. CGM glucose and BG were identical. Probably a bad site. 5. Again, the sound of the monitor alarm is loud enough without being obnoxious. It is more like a chime–not at all like an alarm clock. 6. Large numbers on the monitor easy to read for someone who needs glasses for both distance and reading! 7. Easy to turn off alarm–icon is lit and located on the top of the monitor. 1. No “On/Off” button. To keep the monitor from alarming when KC is not in range–such as at school–you need to touch the icon on the top of the monitor. This silences the alarm. Touch it again and audio is reactivated. Actually very easy and because the monitor is never off, it begins to read her as soon as she comes back in range. 2. No backup battery power for either the monitor or Outpost. This is something that I cannot believe the engineers overlooked! 3. 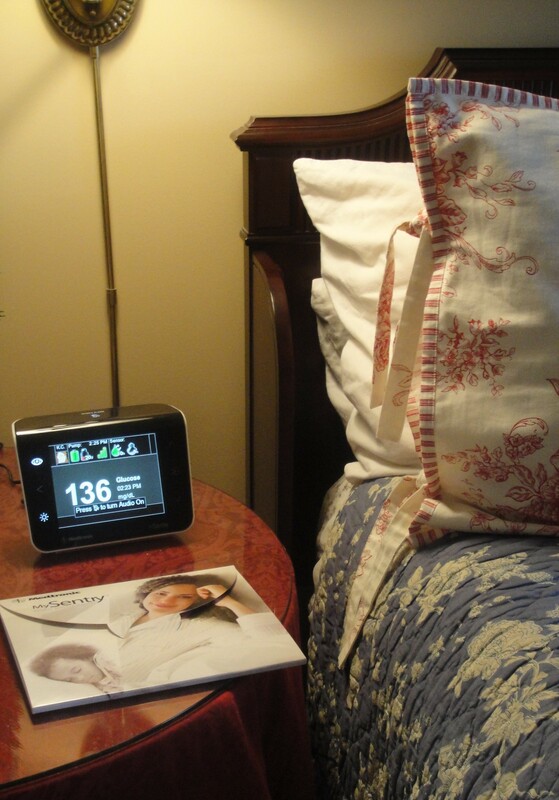 Outpost has the plug directly in it (like a nightlight has)….if you want it on the bedside table, you will need to have an extension cord. Posted in Continuous Glucose Monitoring, For the Newly Diagnosed, Insulin Pump Therapy, type 1 diabetes and tagged Medtronic mySentry, Paradigm Revel Guardian. Bookmark the permalink.